As one of the smallest European capitals by size and by number of residents, Ljubljana offers a boutique experience for it takes only 20 minutes of a leisurely walk to get from the famous Triple Bridge set in the very heart of the city to most of the spots, be it either towards the bountiful of architectural heritage and diamonds, or to the very middle of a natural setting in Ljubljana’s main and most beautiful Tivoli Park. Not just “boutique”, but also “green” is the word that crosses everyone’s mind once in Slovenian capital which has 542 square meters of public green spaces per resident, while featuring 80 hectares of well-maintained green spaces. The process of transforming Ljubljana into a role-model city in terms of sustainable development has been crowned by many awards so far, including the title of European Green Capital 2016 and this year’s title of the »Best Destination of Europe« in recognition for best sustainable practice examples of destination management worldwide. Ljubljana’s unique mixture of beauty, compactness, green character and sustainable policies is furtherly strengthened by its cultural and artsy soul. Culture, for example, is embedded in its everyday life and is not considered a privilege. The year-round agenda features a multitude of international festivals and other events, encompassing a wide range of musical and artistic genres, where traditional lives side by side with the alternative. For being the city that flourishes in various colours of creativity and arts, Ljubljana has become renowned as the Open City that welcomes the innovative, unusual, and progressive approaches to showcase its creative and welcoming side. Be it either its squatted ‘city inside the city’, the Autonomous Cultural Centre Metelkova City, or the numerous street, art, and cultural festivals like Lighting Guerilla, Ana Desetnica Street Theatre Festvial, Indigo – Festival of Contemporary Ideas, Feminist and Queer Festival Red Dawns, LGBT Film Festival, or music festivals like Druga godba, Festival June in Ljubljana, Jazz Ljubljana, or theatre festivals like Young Lions. 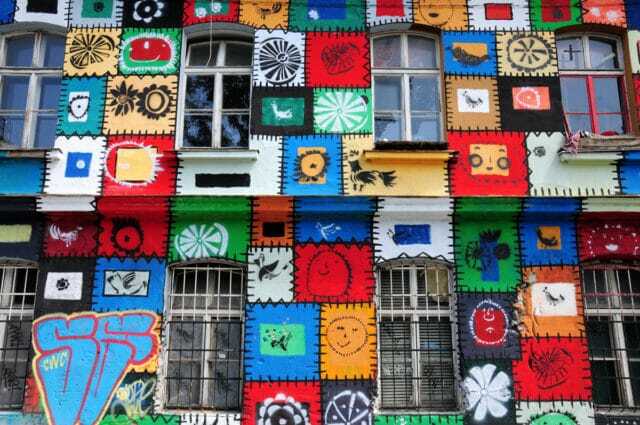 In addition, Ljubljana boasts alternative venues like ŠKUC Gallery, Kino Šiška, Dobra vaga, Ljubljana’s Old Power Station, Glej Theatre, Mini Theatre, PTL – Dance Theatre Ljubljana, and Španski borci Cultural Centre, to name a few. Walking around this small in size, but big in character, Central European city, adds to the city’s sustainable mobility solutions for the core of the city center has been closed for motorized vehicles. The city’s sustainable traffic policy is just one in the line of Ljubljana’s sustainable policies that made it one of the most sustainably-oriented cities in the region. Ljubljana, for example, has been the European capital with the highest share of separated waste collected (63%) and the ‘zero waste’ city which has already exceeded the EU’s recycling targets for 2020 by 10%. The recently established Moustache Tour presents a unique opportunity to get familiar with one of the youngest and most creative European capitals that never ceases to surprise. The tour takes on a ride through the lifestyle of architect Jože Plečnik (1872-1957), writer Ivan Cankar (1876-1918), and painter Rihard Jakopič (1869-1943) who all lived in the same historical period and who wore impressive moustache – but of a different style that corresponded also to the difference in their personal and artistic character: disciplined, bohemian, and charismatic. DobraVaga, a selling art gallery showcases the work of younger generation Slovenian artists in a very original way. The gallery, located in the Ljubljana Central Market’s previous fish market, with its unique concept, tries to transcend the conventional notion of the art market. Each time, its monthly selection features works by a new set of artists and new approaches to art. Rather than promoting the artists’ names and reputation, it focuses, in keeping with its concept of selling art ‘per kilo’, on the artistic weight and power of exhibited works and the nature of the creative process involved in their production. This serves as the basis for classifying the works for sale into different price categories. Thus, a perfect gift from Ljubljana is to buy one of the exhibited pictures from a young Slovenian artist in Dobra vaga. A different gift and purchase, as alternative as the Ljubljana’s soul and lifestyle. There aren’t many European capitals as rich in alternative culture and arts as the Slovenian capital. Ljubljana stands as a real gem compared to other cities when it comes to the bounty of independent venues and events bursting at the seams with alternative spirit. The alternative scene is so accessible that one could almost claim it has been intertwined with the capital’s mainstream lifestyle and beat. Ljubljana, the Open City, has been for decades the welcoming nest for diverse alternative approaches and activities. Autonomous Cultural Centre Metelkova City, for example, was established in 1993, when mainly underground artists and intellectuals squatted former military barracks and have, since then, developed the squatted infrastructure into an alternative culture centre that has become a worldwide attraction. Diverse artistic practices and events found their home at this ever-changing complex full of creative spirit. A necessary visit for any young congress guest or a congress guest young by heart and alternative by soul looking for a different experience of the city. For those, seeking independent arts and culture, Ljubljana offers numerous spaces that showcase the best contemporary Slovenian as well as international independent performance arts scene spanning from independent off-off theatre performances to contemporary dance performances and art festivals. In addition, some of the venues can be rented for an out-of-the-box event organisation or incentive programmes. Located in Ljubljana’s old town, the Glej Theatre is Slovenia’s oldest independent theatre founded in 1970. Also located in the Old Town is the Ljubljana Mini Theatre which through its paradox goal – to be an elite theatre that is accessible to the public, eccentric yet attractive for a wide audience –breaks the traditional boundaries of theatre. Dance Theatre Ljubljana (PTL) is a small but artistically exciting contemporary dance theatre which in its venue presents to the public a wide range of selected Slovenian and international contemporary dance creativity. Part of the premises of Ljubljana’s Old Power Station is Ljubljana’s unique example of a long and well-established international tradition in transforming attractive industrial structures into cultural centres. And last, but not the least, The Španski borci cultural centre is dedicated to promoting contemporary art practices. Due to its accessibility and the well-developed and diversified meeting infrastructure, Ljubljana is Slovenia’s major congress destination, having the highest share of (international) meetings. When in Ljubljana, any congress guest should seek the non-conventional ways of spending time and getting to know the city, its history and its people. Most of the festivals take place outdoors and for free, and therefore, Ljubljana is not just an Open City because of offering the artsy and imaginative events, but also because it is simply that: a wide open venue for all sorts of non-conventional festivals that allow for a having a fun stay in Ljubljana to any congress guest.